Up to now, including January 2009, we have published news dealing primarily with the pastoral activity of our bishop and a little more news of special interest. We are asking that, beginning next month, the various deaneries make a short report highlighting their events to be published here as well. We hope they will send us their reports in a timely manner. 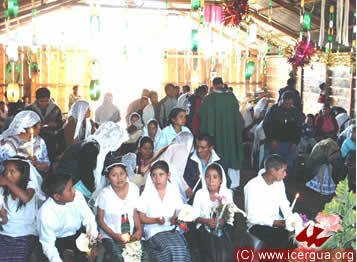 On the first of January our bishop began the New Year by celebrating Eucharist in the peak of the Cuchumantanes with 2000 brothers and sisters of the communities of Chiantla, Huehuetenango, who had gathered together to renew their commitments of service and to entrust the year that was beginning to the Lord. It was a very beautiful celebration, which included marriages and baptisms. 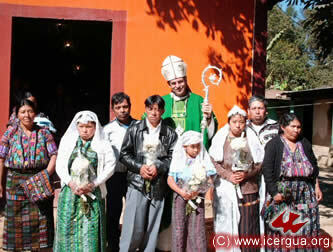 On the morning of January 2 the bishop celebrated Mass in the village of Yulbá de Cuilco, Huehuetenango. 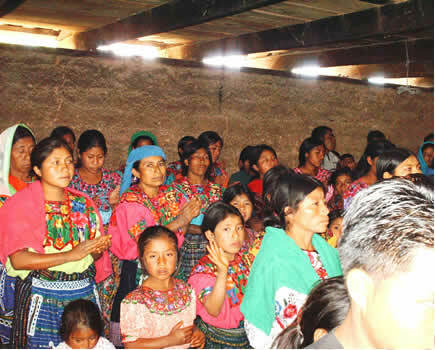 With more than 1000 members, the community of Yulbá is taking the first steps toward being constituted as a parish, along with other communities that total more than 3000 members. At the moment they are determined to build a new church as well as to sustain mission activity. In fact, in the last days of December they succeeded in bringing into being a new community in a nearby village. The Eucharist was very beautiful, baptisms and confirmations were also celebrated. 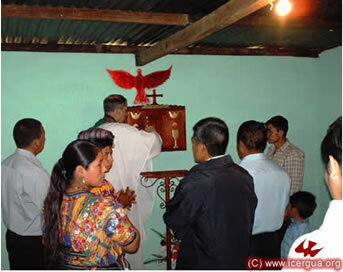 On the afternoon of January 2nd, the Bishop celebrated Mass in central Cuilco. The community is formed by around 3000 members. Those who attended the celebration were very enthusiastic and devout. Confirmations were celebrated. On January the 3rd, the first meeting of the Central Quiche Deanery took place. 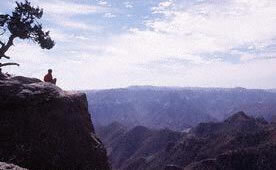 It is formed by the communities located in Sacapulas, Cunen and Uspantan. All together there are around 50. The meeting was attended by 40 delegates, representing the Pastoral Councils. The Bishop presided the meeting. Fr. Luís German Guanopatin, the priest coordinating the deanery was also present. Above: The bishop explaining the implications and significance of the deanery. At his left, Father Luís Germán Guanopatín, who is responsible for the activities of the deanery. A la izquierda: Vista de miembros de los Consejos Pastorales que conforman el Decanato del Centro de Quiché. 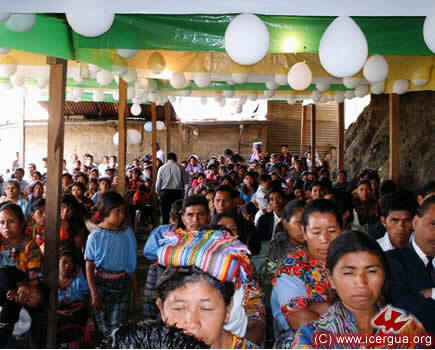 On Saturday, January 3, the bishop celebrated the Eucharist in the Central pastorate of Uspantán, Quiché with about 3000 brothers and sisters participating. It was a beautiful celebration. Representatives of the 30 communities located in the city took part. The communities in Sacapulas, Quiché, are growing very rapidly and have an enthusiasm and power that reflects the presence of the Holy Spirit. On this occasion, Mons. Eduardo celebrated the Eucharist in the community of Tierra Caliente. At the present, they are still meeting in temporary quarters. But they have bought a lot and are beginning to construct their church building. In addition to the Eucharist, baptisms were celebrated. In the afternoon of January the 4th, the Bishop celebrated the Eucharist at the temporary quarters in Cunen. In Cunen, our Church owns a beatiufl pice of land or around 150,000 square meters. In the future, God willing, there will be built the Missionary Center and the headquarters for the Deanery of central Quiche. In Cunen we have around 10000 members, organized in 17 communities. From January the 5th to the 8th, all the priests residing in Guatemala, as well as the 4 sub-deacons, met at our Seminary for the Annual Spiritual Retreat. It was led by our Bishop. We were, all together 16. Above: The priests around the bishop and the subdeacons before beginning the closing Mass. To the right and left of the bishop are P. Francisco Simón y Rigoberto Upún, respectively. 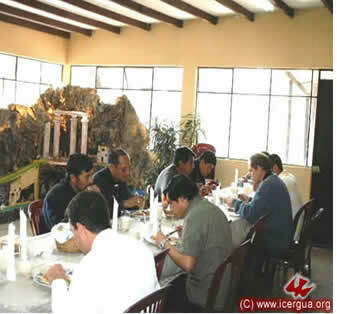 Behind: Silas, Basilio, Herbert, José Ángel, Santos, Fredi Mux, Juan Ernesto Iriarte (one of the ICERGUA missionaries in Peru), Hugo, Germán y Fredy González. At the back are the subdeans; Felipe, Moisés, Marcos and Gildardo. 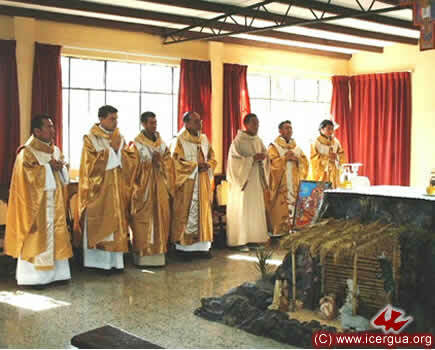 Left: During the Mass: S. Moisés, P. Hugo, P. Germán, P. Fredy, P. Basilio and S. Felipe. 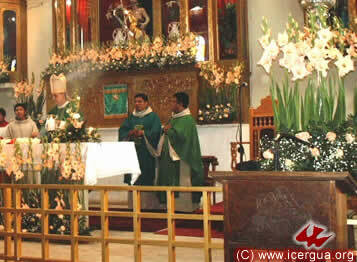 Left: P. Fredy, P. Silas, P. José Angel, P. Juan Ernesto, S. Marcos, P. Rigoberto y P. Francisco during the closing Mass. Left: Mons. Eduardo giving the closing benediction. 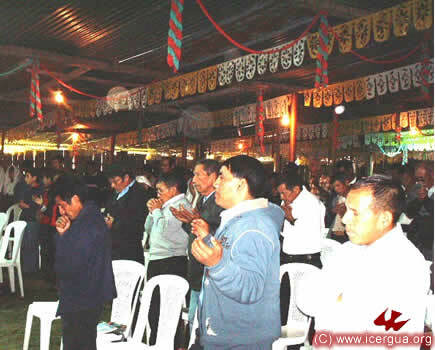 Father Juan Ernesto is the secretary and organizer of the mission in Peru, called ICARPE (The Renewed Catholic Apostolic Renewed Church of Peru). The mission in Peru is growing rapidly. 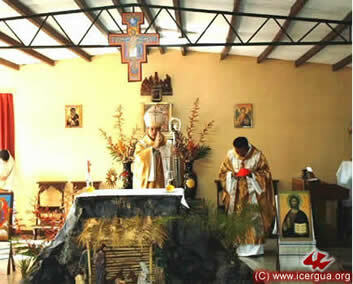 At the moment there are more than 20 communities, centered in Santa Rosa de Vitarte, a suburb of Lima. 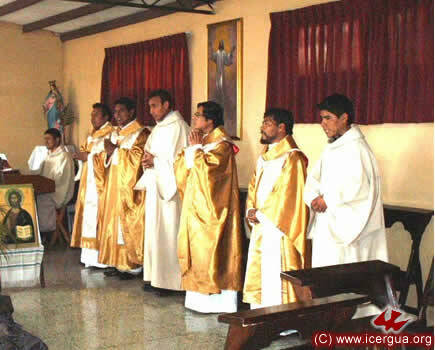 Three of the priests who are working there are installed in ICERGUA, and there are two more in the process of being installed, plus a seminarian. During his visit in Guatemala, Father Juan Ernesto first participated in the closing part of the Priests Retreat, then he visited some of the communities in Guatemala City, and then the Cathedral. 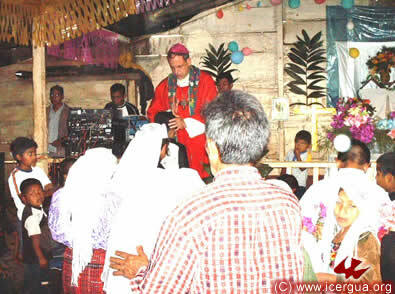 Afterwards he accompanied the bishop through the northern part of Huehuetenango. 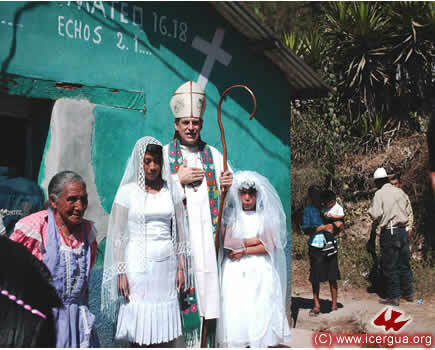 He celebrated Mass with the communities in Nucá, Barillas and Soloma in Huehuetenango and in Uspantán in Quiché. 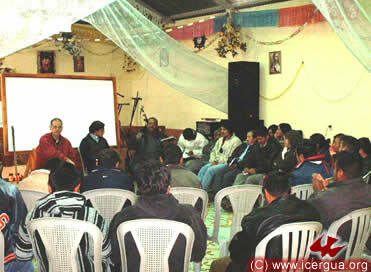 On returning to the capital before leaving for Lima, he was with us for the first two days of the seminary classes. His testimony was that for all his life he has felt the lack of a Renewed Catholic Church, and prayed God to lead him to one and finally, when he entered into communion with ICERGUA, he realized that the Lord had answered his prayers. Over and again he said that he had experienced “an authentic new Pentecost.” Now, having returned to Lima, he is working mightily for the consolidation and expansion of ICARPE. Our bishop has planned his second visit to its communities for the end of March. As part of the visit, he will celebrate a Chrismal Mass so that the priests may renew their commitments and the oils may be consecrated. At the Priests Retreat, the subdeacons had the opportunity to talk with the priests posted in the various deaneries in which the subdeacons will spend their year of supervised pastoral practice. They agreed that the assignments would be as follows: subdeacon Juan Moisés Mendoza Sapalú will do his pastoral practice in the deanery of Barillas, subdeacon Luís Felipe Corimanya Monge, will do his in the deanery of Santa Eulalia; subdeacon Marcos Manuel Caicedo Tenorio will do his in the deanery of Center of Quiché and subdeacon Gildardo Ramírez will do his in Tzanixnam, Totonicapán. This trial period for candidates for the ministry includes, in the first semester, before entering the deaconate, a comprehensive humanities examination and a thesis on philosophical questions and, in the second semester, before entering the priesthood, a theological synthesis and the presentation and defense of a theological-pastoral thesis. 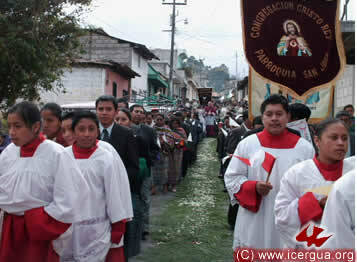 On the tenth of January the bishop celebrated the Eucharist in the community of Vuelta Grande, Antigua Guatemala. This community began three years ago with one family. Now it has more than 100 members. With their own hands they have built a church and are actively working in evangelism. 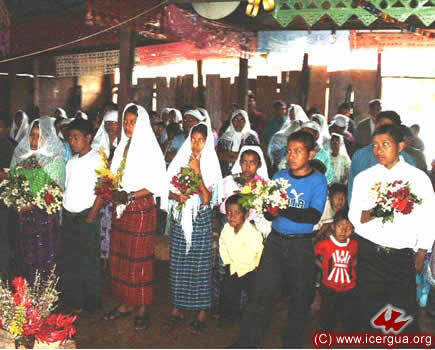 At 11:00 a.m. 33 baptisms were celebrated within the Eucharist in the community of Los Guates, San Juan Sacatepéquez, Guatemala. It was a great festival. After four years in which the members of the community had been deprived of the sacraments, they finally succeeded in having their children baptized. In these four years, the community went from having 30 members to more than 300 adults today and a total of some 800 including young people and children. Now they are committing themselves intensely to witness to their faith. Above, at left, below at left: The community during the celebration. Below right: Mons. Eduardo raising the Holy Sacrament in the chapel specifically built for adoring it. 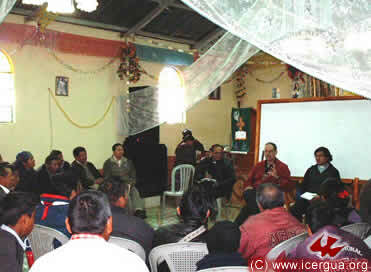 On the 13th, the first meeting of the deanery north of Huehuetenango, which covers the cities of Barillas and San Mateo Ixtatán, took place. 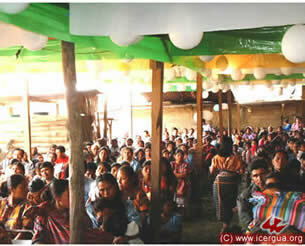 The pastor the area, Father Hugo, presided, and more than 100 brothers and sisters were present. Then the bishop arrived and took some time to explain the function and meaning of the Deanery. The initiative was unanimously approved by those present. Our Church in the city of Barillas has about 70 communities and some 40,000 members. San Mateo has 10 communities and more than 10,000 members. With the Church’s two community radio stations—Radio Charisma in city center and New Life in the suburb of Nucá—a magnificent missionary activity is being carried out. Above: The bishop speaking to the participants about the deanery. 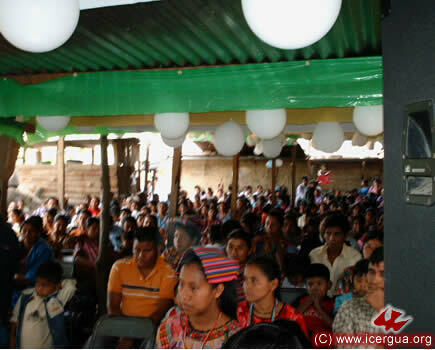 On the afternoon of the thirteenth, the bishop met with the leaders and some members of the community of El Quetzal, Barillas. This community, comprised of some 1000 members, is admirably organized. Its generosity and the seriousness of its leaders are outstanding. On the occasion of the visit, Eucharist was celebrated with everyone and the sacrament of Confirmation was administered. The bishop arrived at the distant community of Nueva Generación Maya, located in the northwest part of Barillas, near the Mexican border, on the afternoon of the 14th. Consisting of families who returned after the armed conflict ended, this community is in process of constructing a new church building. At the moment it is meeting in a temporary church. Children had been prepared with great care for their First Communion and young people for their Confirmation. 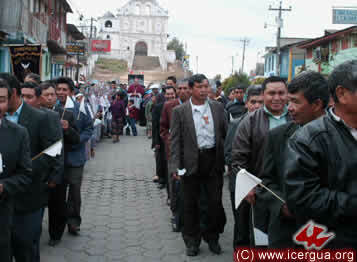 On the same day in the afternoon, after driving an hour, the bishop arrived at the community of Siglo XIX. Brother Miguel, founder and coordinator of the Community gave us a cordial welcome, and Eucharist was celebrated. These communities are getting organized and setting up the councils necessary for being established as a parish. Above: Preparing for the Eucharistic celebration, some of those who will receive the sacrament of Confirmation. Left: In the kitchen, Bp. Eduardo, accompanied by P. Juan Ernesto Iriarte, along with some of the faithful members of the community of Nueva Generación Maya. The village of Pojom (under the administration of San Mateo) is located in the north of San Mateo Ixtatán, very near to the Mexican border. The road there is long and hard, but the trip is worth the trouble, for the community is extremely active and enthusiastic. It has about 1500 members. They gave the bishop a special welcome. In spite of the inclement weather, the group took the long walk from the entrance of the village, where the bishop was warmly received across from the school, then passing in front of the new church, now under construction, and finally arriving at the temporary church. The faithful packed the church, and even filled the street opposite. Baptisms, First Communions, Confirmations and Installation of three new ministers were celebrated. 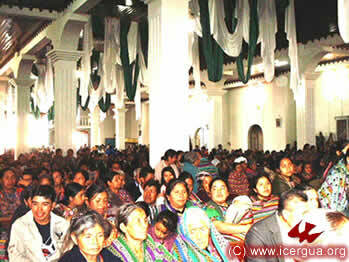 In the afternoon the celebration was in the central church of San Mateo. Many of the faithful were there, many of whom celebrated Confirmation. Above: The community welcoming the bishop opposite the neighborhood school. Left: A multitude walking with the bishop from the school to the site where the provision house of prayer is located. Left: The bishop giving individual absolution to each of those who will receive Confirmation and First Communion, before beginning the Eucharist. 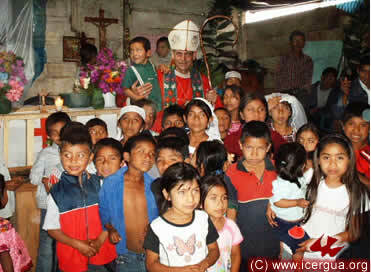 Below: The bishop surrounded by some of the children who took part in the celebration. The first meeting of the Deanery of Santa Eulalia revealed the commitment and dedication that all our members have accepted. 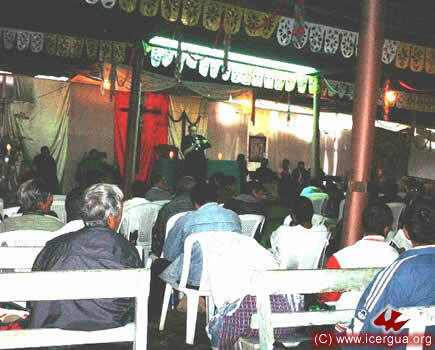 Present were members of the Pastoral Council of the Renewed Catholic Parish of Santa Eulalia, representatives of the Parish Council of San José Quixabaj, representatives of the communities of San Miguel Acatán and San Rafael La Independencia, which is the process of being constituted as a parish, and representatives of Soloma and San Juan Ixcoy. The bishop presided at the meeting; Father Fredi Mux, priest in charge of pastoral care for the deanery, was also present. Above: Brother Gaspar, President of the Pastoral Council of the Parish of Santa Eulalia, addressing the participants. At the side: Our bishop, accompanied by Fathers Juan Ernesto Iriarte and Fredi Mux, giving valuable explanations to the participants. In the afternoon Eucharist was celebrated in the Community of Belén, Santa Eulalia. The faithful in Belén have built a very beautiful church and at present are in process of completing the pastoral home in which the priests who give pastoral care to the area will reside temporarily. In Santa Eulalia our Church has a lot on which we hope we can soon construct the Mission Center as a permanent residence for priests who are working in the deanery. At midday on January 17 the priest celebrated the Eucharist in the Community of the Immaculate Assumption in the outskirts of San Miguel. 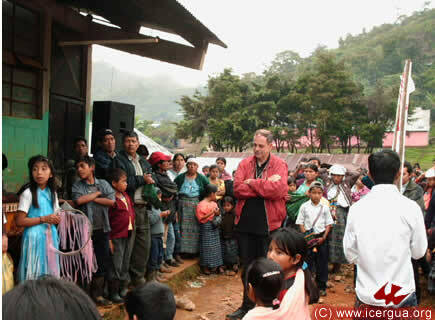 That community is the center of numerous communities that, under the coordination of Brother Alonso are growing rapidly. In the afternoon we celebrated in the community of Nueva Jerusalén, coordinated by Brother Marcos, in the center of the town. It is also the center for many other communities in the outlying villages. They managed to construct their church in just a few months and are planning to enlarge it, owing to the rapid growth that they are experiencing. On Sunday the 18th, representatives of the communities of the Deanery of Santa Eulalia, presided by the bishop, made a pilgrimage from the center of town to the Jolomcú neighborhood, located in the outskirts, to celebrate the Eucharist. In San Rafael there was no Renewed Catholic community until the numerous faithful felt the call to form a community in the center of the town. Now they have bought a 13,730 square-foot lot, have built a provisional church and have about 150 members. During the Eucharist, First Communion and Confirmations were celebrated. Above: The bishop administering individual absolution to the participants at the Eucharist. 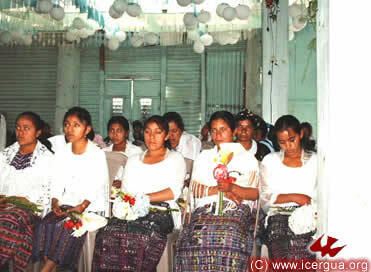 In the foreground are those who will make their First Communion. Right: The group of those who will receive the sacrament of Confirmation. 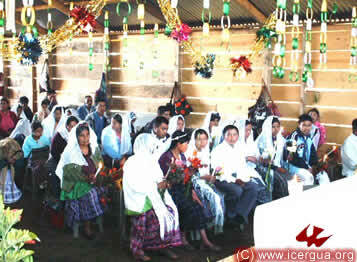 On the eighteenth in the afternoon Eucharist was celebrated in the Community of Ixlahuitz, Soloma. This area has suffered terribly from crime and violence. The faithful in the community have renewed their commitment to evangelize and to be signs of love and reconciliation in the whole village. This community, which, in 2004, was the first to make an alliance with the Church, continues to grow. They have bought a lot of about 19,000 square feet, and are planning to build a beautiful church that will hold more than a thousand people. The 19th was the day when the seminarians arrived. We are expecting that this year the number of seminarians will reach 40; we are still awaiting the arrival of three or four more. On Tuesday and Wednesday, an evaluation of the previous year was carried out, and Plans of Study for the current year were established. There will be work in five specific areas: humanistic education, communitarian life, spiritual deepening, academic education, and pastoral training. From Thursday to Sunday our annual Spiritual Retreat took place. We camped at the Hacienda Carmona in San Juan el Obispo, near La Antigua Guatemala. 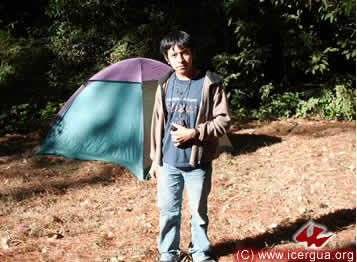 These were days of peace, contact with nature, and intense spiritual experience. 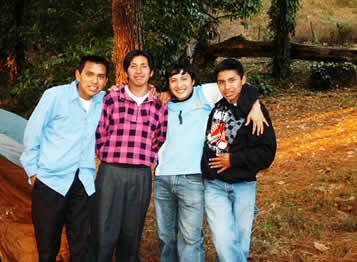 Above, right: Two Jakaltec seminarians and two Kanjobals: Jorge, from San Rafael La Independencia, Ismael de Santa Eulalia, Eduardo de San Miguel Acatán and Baltazar from Barillas. Left: José Alfredo from San Antonio Aguas Calientes. To the side, right: Moisés from San Juan La Laguna, Marco Tulio from El Salvador, Pedro from El Salvador and Felipe from Peru. On the 25th two anniversaries were celebrated together in our Cathedral of St. John in Comalapa. 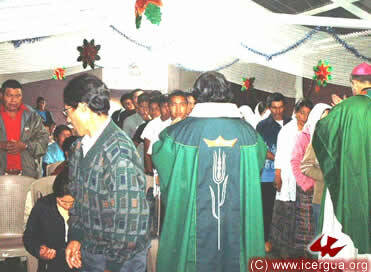 It was the fourth anniversary of the Alliance, that is, the beginning of the formation of ICERGUA, and the first anniversary of the Deliverance from Extermination that the civil authorities and the Roman Church hierarchy had agreed to carry out on the 23rd of January, 2008, but the Lord miraculously saved us. At present the communities of the Cathedral are being cared for pastorally by Fathers Rigoberto Upún and Francisco Simón; the people of God see in their presence a genuine sign of the Lord’s blessing. In his homily, the bishop indicated that the experience of the communities of the Cathedral is very close to that of the people of Israel: the anniversary of the Alliance is like the Passover of Israel, which remembers the liberation from Egypt and the Deliverance from Extermination is like “Purim,” when the Lord saved his people from the extermination planned by Amán. The celebration began with a walk from the Calvary to the Cathedral and culminated in the Eucharist, which a very large number of the faithful attended. Above: The welcome at the Church of the Calvary. Right: Procession of thousands of the faithful to the Cathedral. Below left: The Cathedral packed with people. 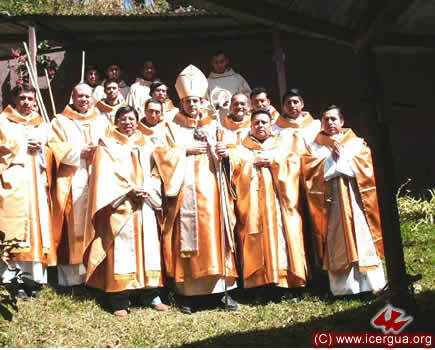 Below right: The bishop incensing the sanctuary in the presence of Fathers Francisco and Rigoberto, Pro-Vicar and Vicar General of ICERGUA and pastoral coordinators of the Cathedral. 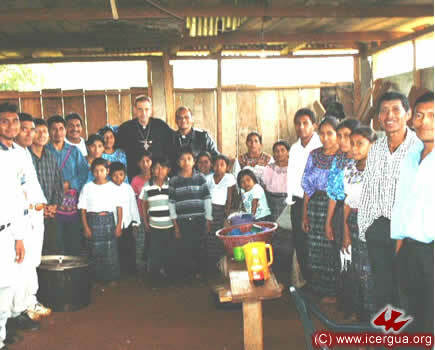 On the same day, January 25, the bishop visited the community of Xolbé in Sololá to celebrate Eucharist, in which were received the director of several radio programs in the Department of Sololá and his family. It was the occasion for four of his children to take their First Communion. 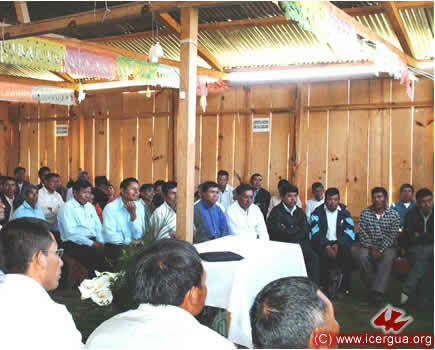 On the 30th the bishop sent a letter to Father Luís Gabriel de la Rosa, who had requested that the process of joining ICERGUA begin, with the view that in the near future it would be possible to begin formally to establish a mission. The work is to begin in the northwest of the country, in Monte Libano, Department of Córdova. Already there is a community of some 50 people. Father Luís has now formally received a charge to work for the creation of communities, to contact other priests who feel called to join the mission and to take all the necessary steps to be able formally to create the mission. 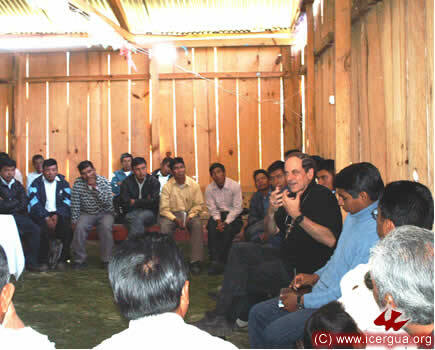 We already consider Luís Gabriel and all the members of the communities to be part of ICERGUA in Columbia.